Starting of motor on minimum limited Current and Power. Contrôle de l'amplitude du signal - No Harmonics. Smooth starting and continious acceleration. Rugged magnetic design - no maintenance. Build in by-pass for full voltage run. 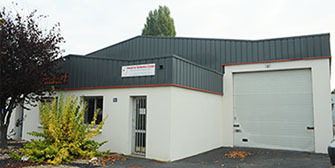 Operating at normal ambiant temperature up to 50°C. Designed for no need of air or water cooling system. Can be located near the motor. Easy retrofiting on existing installations. Higher motor life due to less stress. Higher equipment life due to no stress. ER & MC options with NSC1 to reduce generaly the starting current down to 1,5 x fla. Innovative Technomics as the name suggests is engaged in developing new products and technologies for the industry. The company was founded on the principle of innovating technologies of international repute. As a result, today we have developed a wide range of Soft Starters for pumping station to industrial applications and Defense. In each field, Innovative Technomics products have been acclaimed as unique in technology as well as in reliability.